Help Mike: Bookseller! This comic needs all the support it can get! Please, thanks, you’re all awesome! Lark would usually have a set schedule. 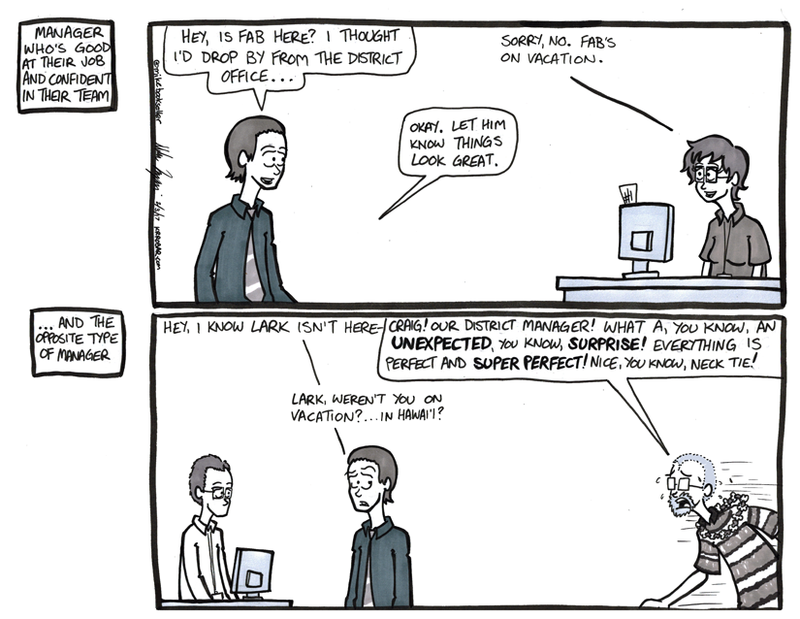 There were days that we employees could breathe a little easier, the days where Lark wasn’t at the store. It was usually in the middle of the week. A Wednesday or Thursday. It was a small, brief spot of relief through the workweek. Our district manager would usually show up announced ahead of time. He’d set a time as to when and what stores he’d check in on, and those stores would then let other stores in the district know of the impending visit. Certain managers would be fine with it. They’d be relaxed and not worry too much about having their boss show up. Even when the district manager would show up UNannounced. Not so for Lark. He’d get all panicked and sweaty. Pacing back and forth, his lies would become more outlandish, his nervous ticks more pronounced. All of that negative energy would be taken out on the staff unfortunately, but I can look back at it now and laugh. That little weasel had dug such a big hole for himself it’s no wonder he was always a jumpy bag of nerves.